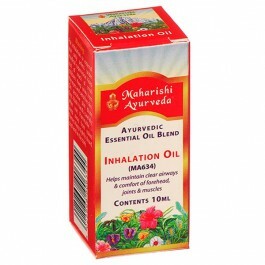 Ayurveda recommends several types of aqueous, powdery, oily or other preparations for the nose. 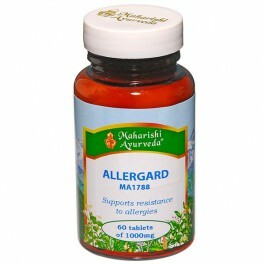 Nasya refers to the use of this age-old Ayurvedic tradition. According to Ayurveda, Nasya should be an integral part of the daily routine and can be done several times a day. 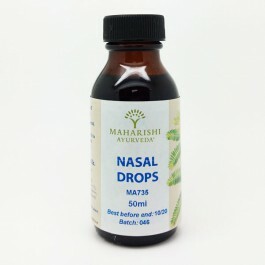 Maharishi AyurVeda Nasal Drops is made up of an abundance of beneficial herbs, oils and spices. With vetiver, nut grass, cinnamon, cardamom, sandalwood. 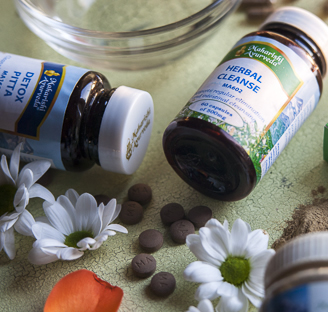 Supports mental clarity and health of upper respiratory tract and sinuses. Nasal Drops are for sniffing up the nose. They contain 27 herbs infused into sesame oil and goats milk to balance, purify and protect your nasal passages and sinuses, and help keep them clean and free of toxins. 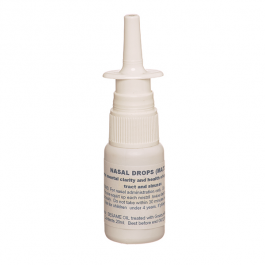 Clear nasals passages support clear thinking, resistance to infection and eye function. Contents 20ml in a spray pump - 40 days supply. Apply to nasal area carefully. Put one spray (0.1ml) up each nostril several times a day. Do not use within 30 mins before meals or bedtime. Do not swallow - spit out any mucus that comes down the nasal passage. May be used continuously for maximum benefit.